Another spotlight for you all! If you are or represent an upcoming artist, designer, dancer, etc., please visit our Features/Submissions page for more info on how to be featured on The Spotlight! 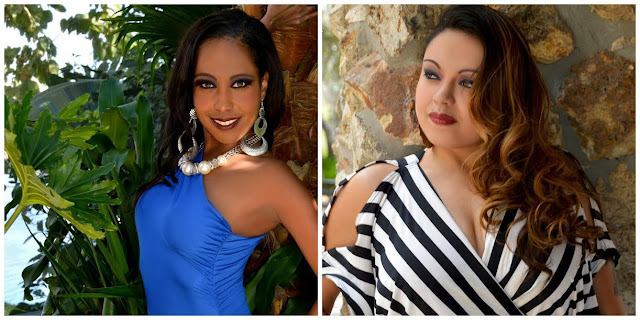 Today we have radio hosts and models Jae Monique and Sarah “Chi Chi” Figueroa! The two host their own weekly radio show, the Outline Radio Show, and also model for Timothy R Clothing. The two had crossed paths several times, but were officially introduced by a mutual friend. At the time, Sarah had planned to start a talk show with a local broadcasting network, but that didn’t pan out. “But all that work was not done in vain,” Sarah admitted, noting of her eventual collab with Jae “What I realized was we had great chemistry and we feed off each other.” Jae brought Sarah on as a co-host for a show that she was developing, and the Outline Radio Show was born! “We began on Blog Talk Radio, and it took off from there,” Jae said of the show. On Outline, the ladies discuss entertainment news, relationship advice, and even bring on different industry guests for interviews. Some of their past guests include Cocoa Brown, Robert Townsend, Isaiah Washington, and Mekhi Phifer. “We are outspoken, unfiltered, and controversial,” Jae said of the show. “We are not scripted, so we get to be ourselves.” Check out one of their more recent episodes below! Jae and Sarah are also models for Timothy R Clothing, a clothing brand that works provide women fashionable clothing for all occasions. “I was actually on Facebook, and received a message from Timothy Richards himself,” Sarah said of the opportunity. “I told him I loved his clothing. From there, he told me that he would like [me] to come do a test shoot.” After doing a few shoots, Sarah invited Jae along for the ride, and the two began taking pics for the brand together! In addition to the radio show and their modeling gigs, the ladies have their own company, Lions Vision, which is an emerging public relations company for branding and entertainment. They are currently working on a few upcoming events for the company. Sarah herself is also currently shooting two films: a Ponce De Leon documentary, as well as a comedic film, Betty Bangzer Spa! With all of this going on, I had to ask the ladies how they balance it all! The two credit their time management skills with keeping it all together, especially as Sarah is a single mom. “Time management and prioritizing is the key to balancing your life,” she admitted. In the future, both Jae and Sarah hope that Outline will be known and heard nationwide, and for their show to eventually be recorded on video! The two also have their own individual goals as well. “I would love to do on-camera interviews on the red carpet as a media personality,” Jae said. “[I] want to also get into more acting roles.” Sarah added, “I want to continue my plus size modeling, as well as have my non profit (which focuses on empowering women towards their future) up and running.” With their work ethic and drive, these two are definitely on their way! Be sure to connect with these talented ladies through the show's social media channels!